As the elderly age, they become increasingly susceptible to falling and the dangers can be much worse. With aging diseases like osteoporosis decreasing stability and others with symptoms of nausea, fatigue and a decreasing eye sight, we must be alert for potential hazards. A fall or injury that may be considered lightly to a younger adult, can be very harmful to an elder. So what should you do to keep the elderly safe a protected? The good news is that many falls happen in the senior’s home and could have been prevented if the hazard was removed or precautions were taken. By leaning from previous faults, we can help to create a safe home environment to keep seniors healthy, happy and independent. 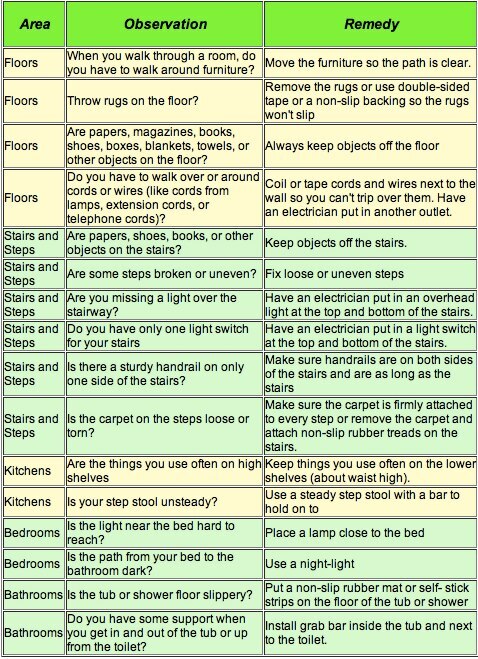 To help keep the senior safe, go through each one of these observations in every area of the house and ask yourself the questions. Your response could mean that there are potential hazards in the home that can be resolved, it may only take 5 minutes to be the difference between a safe home and an medical visit. Once the steps have been taken to create safe home environment, you can also help seniors to prevent falls and stay independent by taking extra steps according to disabilities or aging diseases. Many of these steps can be done both outside the home and inside the home and could have a tremendous benefit on their health and overall wellbeing. If a senior has osteoporosis, it may help to work on balance exercises in the home. These can be learned at the local senior center and more information can be found in the Elder Helpers’ guide to caring for seniors, the Caregivers Guide to Compassion. They can also use a cane or walking assistant in the home, many are available online or at your local retail stores. For vision problems, speak with the senior’s eye doctor about solutions that can be taken outside the home. When the elder is at home, you can increase the lighting during the day, leave lights on at night and clear unnecessary objects from the walking paths. The specific assistance depends on the level of severity for a loss of eyesight, if it is much worse, the elder should consider also staying away from driving activities and obtaining a dog trained to help her. There are many steps that you can take as a caregiver to help seniors to stay healthy by prevention. However, if a fall does occur and they cannot get back up without assistance, they should be able to easily call for help. If a senior owns a cellular phone, make sure that they have it on them at all times in the case of an emergency. It is important they if they need help, they have access to it and if you are not available they can call another person as a backup.